Old Home Week advertising went beyond the usual ad in the local paper or the placement of ads in the souvenir book. 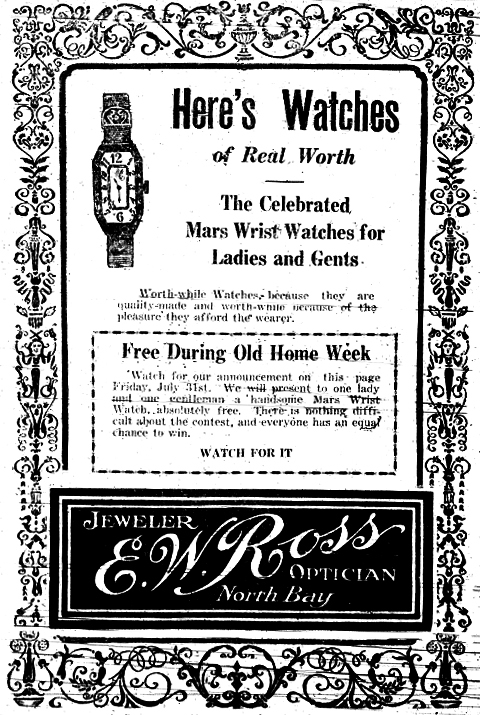 A special full page advertisement was placed in the Toronto Globe for the 1925 OHW in a format that resembled those of other towns. It consisted of stories and pictures as well as more obvious advertisment of the event. The Globe made a specialty of these special pages and even sent a representative to North Bay to discuss it. The cost was was $220 for a half page ad. Special promotions were also organized in which expensive items were given away in a raffle-like promotion. The OHW organizers themselves gave away a Studebaker Six. It was given away free to the person who became president of the OHW Association. Members of the association paid a dollar to join and the President was chosen based on a draw from the names of all members. A total of 1200 people entered the draw to become Honorary President of Old Home Week and 5000 people were there to watch the final draw. Tickets were loaded into a washing machine for mixing and the winning ticket was selected by Ms M. Baxter. Mr A. Smith announced the winner, Mrs P. Moriarty, the wife on a T&NO employee, who was presented with the keys to the vehicle. Since such a car cost about $2,000 at that time, this promotion definitely made money for the OHW organizers, and even more so if the car was provided at cost. Cochrane Hardware gave away two large ticket items during the 1925 OHW. The first contest required guessing the number of tools on display and offered the winner a Findley Tortoise Cook Range as its prize. 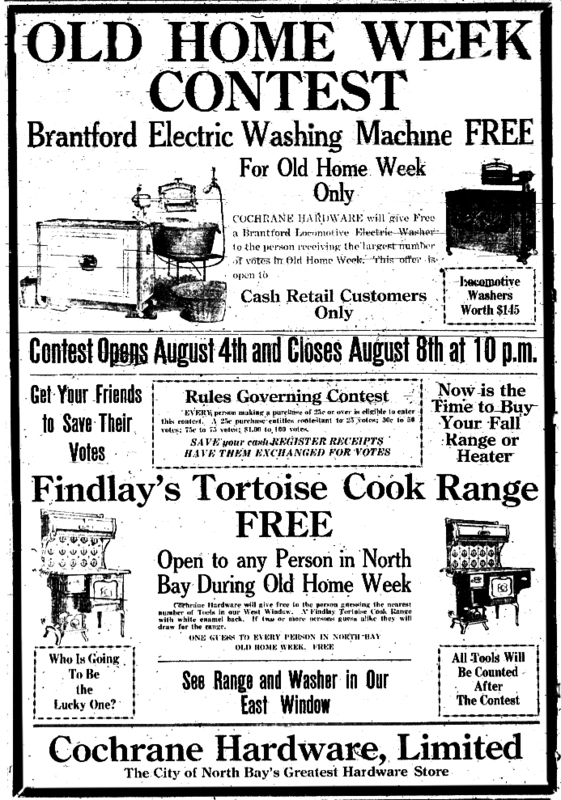 The second offered a Brantford Electric Washing Machine valued at $145 to the person with the most votes. Votes were based on the value of purchases made during OHW but could be transferred to someone else. Both contests required persons to be in the store. 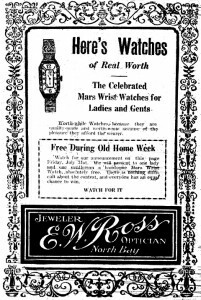 Eric W. Ross gave away both a man’s and a woman’s Mars Swiss wrist watch during OHW. He advertised the give-away in advance but the actual contest rules were not published until July 31st. “Watch for It” his ad read. John Ferguson who owned property throughout the city promoted sales through OHW by giving away a lot free. It would go the person who purchased a lot closest to the lot he had picked to give away. The person who won it, however, could choose one in another location instead if they so wished. This entry was posted in Celebrations, Community History and tagged North Bay, Old Home Week, promotional schemes on January 31, 2013 by Françoise Noël.